There's nothing worse than poor or no mobile phone reception whether your at Home or in the Office especially when you really need it. Do you have a poor mobile signal that drops out in 3G or 4G? is your provider Vodafone, O2, EE, Three, or any other? then we can certainly HELP with Cel-Fi's new range of award winning Smart Mobile Phone Signal Boosters. The Cel-Fi Smart Signal Boosters are now exempt under UK laws and fully meet the requirements of Ofcom regulations (SI 2018/399) allowing us to use certain types of Mobile Phone Signal Repeaters without a License. The award winning Cel-Fi Mobile Phone Signal Boosters and Installation packages are available for Home users or Small Business premises. 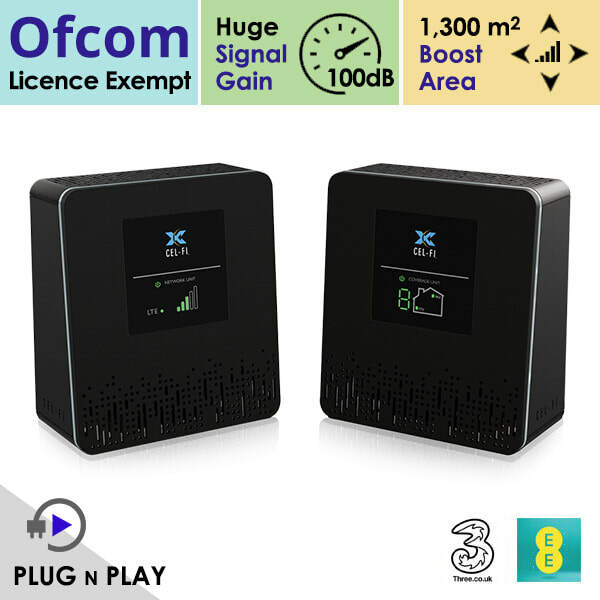 The Cel-Fi Smart Signal Boosters are premium mobile phone signal boosters that strengthens your 3G and 4G signal coverage. It is the first carrier-class mobile coverage solution to feature industry leading 100dB signal gain with an unconditionally network safe guarantee that does not interfere with other wireless devices. 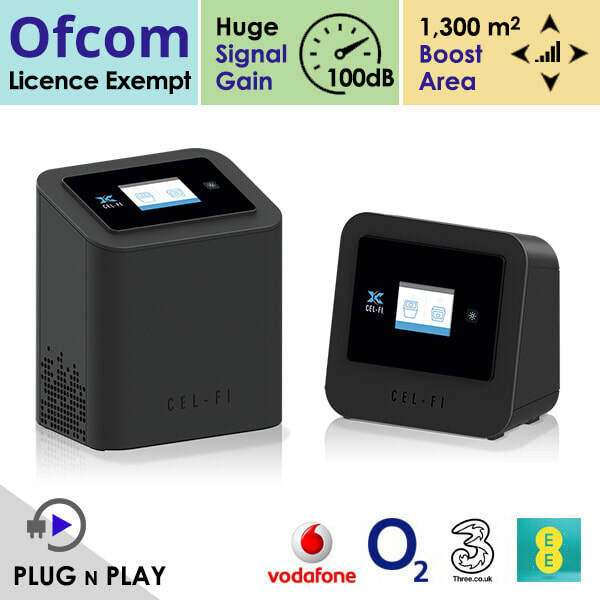 The Cel-Fi Smart Signal Boosters greatly improves voice signals also 3G and 4G coverage for Vodafone O2, EE, Three and many other Networks. The latest technology Cel-Fi Smart Signal Boosters for multiple Networks Voice & Data Services. 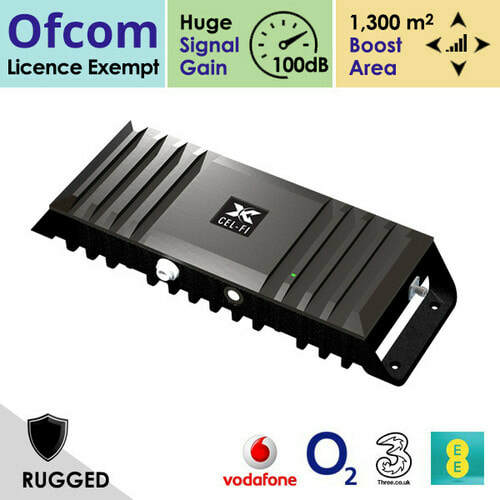 Solution for Boosting 3G 4G Signal on Vodafone, EE, O2, Three, Tesco, Virgin, Sky and other providers. ​Our coverage area includes a 25 mile Radius from our base in Hemel Hempstead which includes the Counties of Hertfordshire, Buckinghamshire, South Bedfordshire and North Middlesex. Hemel Hempstead, Berkhamsted, Northchurch, Ashley Green, Great Gaddesden, Potten End, Studham, Tring, Aylesbury, Wendover, Aldbury, Kings Langley, Abbots Langley, Leavesdon, Watford, Bushey, Bushey Heath, Borehamwood, Barnet, Elstree, Harpenden, Redbourn, Bricketwood, Brookmans Park, North Mymms, South Mymms, Bovingdon, St Albans, Radlett, Luton, Dunstable, Leighton Buzzard, Hougton Regis, Hatfield, Potters Bar, Wheathampstead, Welwyn Garden City, Welwyn, Stevenage, Hitchin, Knebworth, Hertford, Ware, Letchworth Garden City, Toddington, Hitchin, Flitwick, Eaton Bray, Chesham, Amersham, Little Chalfont, Chalfont St Peter, Chalfont St Giles, Great Missenden, Gerrards Cross, Denham, High Wycombe, Beaconsfield, Farnham Common. Farnham Royal, Iver Heath, Iver, Cowley, West Drayton, Stoke Poges, Rickmansworth, Croxley Green, South Oxhey, Radlett, Harefield, Denham, Maple Cross, Eastcote, Hillingdon, Hillingdon Heath, Northolt, Hayes, Northwood, Uxbridge, Ickenham, Pinner, Harrow, Wealdstone, Edgeware, Stanmore, Hatch End, Ruislip, Chorleywood.